This is an eye-opening and amazing story. And it’s all true. 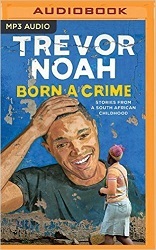 Mostly, it’s about Trevor’s life growing up in South Africa as apartheid fell. There are lots of laughs mixed in with more sobering truths. I highly recommend this audiobook. You are currently browsing the Sonderbooks blog archives for June, 2017.